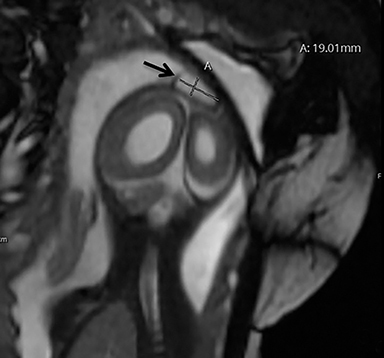 Atretic cephaloceles (AC) are rare neural tube defects accounting for 37.5% to 50% of all cephaloceles.1 Most cases are diagnosed postnatally with several characteristic key finding on postnatal MRI. 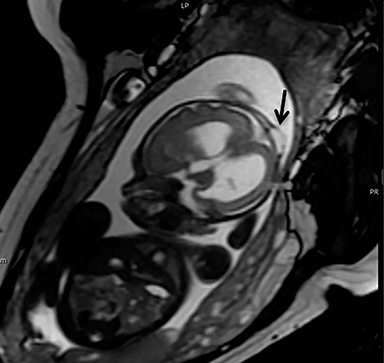 Here we describe a case of AC diagnosed using prenatal imaging. Understanding and recognizing the distinctive imaging characteristics of AC is important in order to aid in accurate diagnosis and to guide appropriate management. 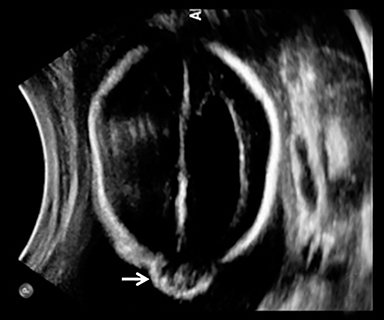 A high-resolution, axial MR T2A 23-week-gestational-age male fetus was found on obstetric ultrasound to have ventriculomegaly with a midline exophytic cystic structure in the occipital region suspicious for a posterior fossa encephalocele (Figure 1). 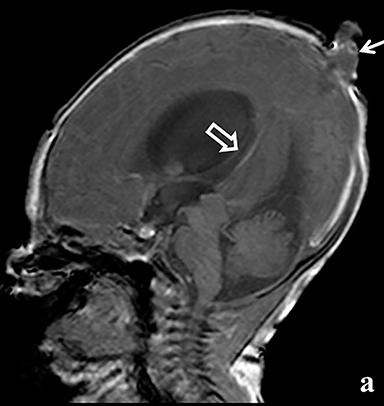 Fetal MRI (Figure 1, GE Signa 1.5 T) was obtained at 26 weeks’ gestation, confirming the presence of ventriculomegaly and a 1.9 cm cystic structure with a thin overlying membrane in the parietal scalp. No brain tissue was present within the cystic structure. The underlying calvarium was intact, but it appeared scalloped. A cigar-shaped cerebrospinal fluid (CSF) intensity collection was present within the interhemispheric fissure. Elevation of the straight sinus was also noted, along with prominent CSF superior to the cerebellum. This constellation of findings suggested the diagnosis of an AC. The fetus was delivered by uncomplicated cesarean section at 39 weeks’ gestation. 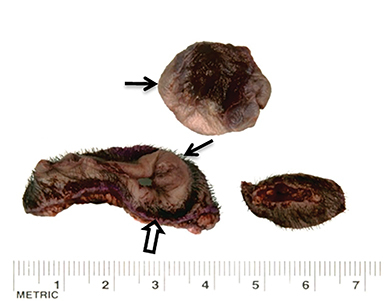 A parietal scalp nodule with absence of hair and a central ulceration was noted on physical examination (Figure 2). 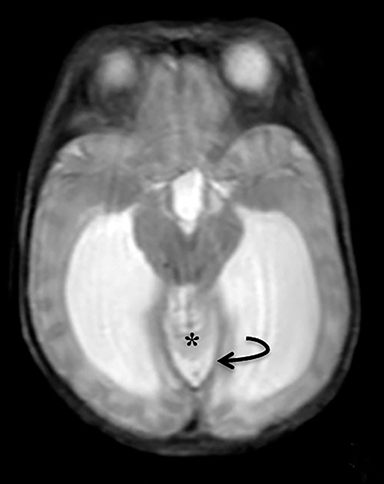 Postnatal MRI (Figure 3) was performed; it demonstrated ventriculomegaly along with an exophytic parietal scalp lesion, an elevated straight sinus, prominent CSF within the superior cerebellar cistern, and an interhemispheric, cigar-shaped CSF cleft similar to the fetal MR image. The “spinning top” configuration of the tentorial incisura associated with AC was better appreciated on the postnatal MRI. 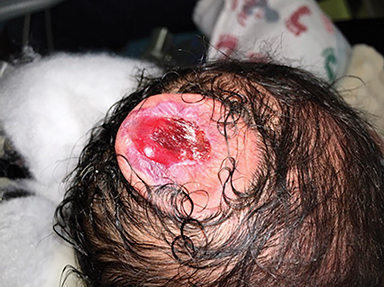 A small amount of serous fluid leakage from the scalp nodule raised concern for possible cephalocele rupture. Therefore, the patient was taken to the operating room for urgent repair. 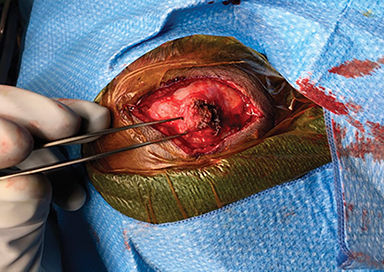 The presence of a fibrous stalk connecting the AC to the dura was noted intraoperatively and was resected along with the cephalocele. The patient tolerated the operation well without complications. 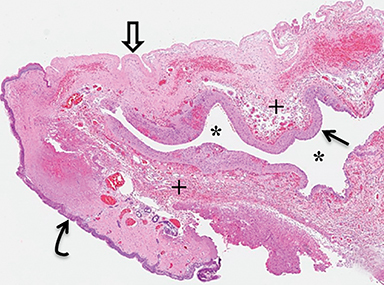 Histopathologic evaluation confirmed the diagnosis of AC (Figure 4). The patient initially did well following resection of his atretic cephalocele; however, he was noted at follow-up appointments to have increasing head circumference. 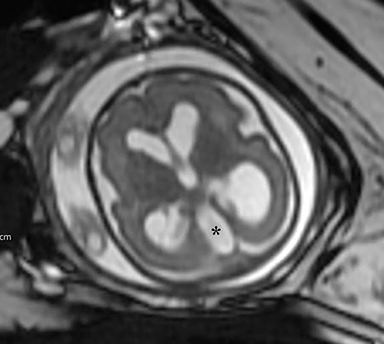 At 6 weeks of age, follow-up MRI demonstrated increased dilation of the lateral and third ventricles consistent with obstructive hydrocephalus. Endoscopic third vetriculostomy was performed with good result. The exact cause of AC is unknown and is a controversial subject. Some believe they develop as a result of incomplete resolution of a larger meningoencephalocele formed during early fetal life. Others believe they may be due to the persistence of a fetal neural bleb caused by an early embryologic “blowout” or persistence of neural crest remnants.1,3,4. Although the exact pathogenesis is unclear, the vertical positioning of the straight sinus is not only a clue to radiologic diagnosis, but also a marker of timing of the proposed embryologic insult. During early cranial venous development, the straight sinus is nearly vertical and the superior sagittal sinus is in the process of forming. Expansion of the cerebral hemispheres results in a more horizontal orientation of the straight sinus, with the typical adult appearance seen by the third month of gestation. The presence of a fibrous strand connecting the tectum to the membranous cranium could result in interruption of the normal progression, resulting in the embryological vertical position of the straight sinus.3 Although the vertical positioning of the straight sinus is a key imaging finding suggesting the diagnosis of AC, it is not always present.4 In these cases, findings on neuroimaging studies are indistinguishable from other entities in the differential diagnosis. 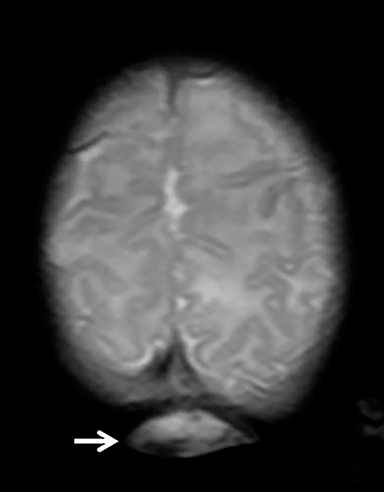 Walker-Warburg syndrome, an autosomal recessive disorder with cerebro-oculomuscular symptoms and a very poor prognosis, has been associated with occipital AC.1,2,4 Although other CNS abnormalities have been reported to coexist in patients with AC, no clear relationship has been established. 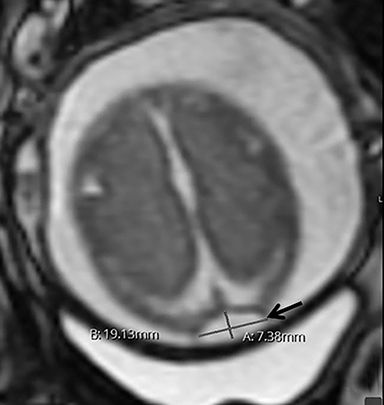 In a study by Patterson et al, 5 of 8 patients had parietal AC as an isolated anomaly while 3 patients had other brain abnormalities, with the most common additional finding being ventriculomegaly.4 The prognosis of patients with AC depends mainly on the presence or absence of other CNS abnormalities. With no other CNS abnormalities, the majority of patients with parietal AC have a good prognosis. In the early literature, there was a reported association of poor prognosis in patients with parietal AC;5 however, this association has not been appreciated in later studies.1,3,4 Due to the rarity of AC, the available literature consists of clinical case series with a very small number of patients; therefore, there is much left to wonder about these lesions. AC is a rare condition usually diagnosed postnatally with several characteristic imaging findings. 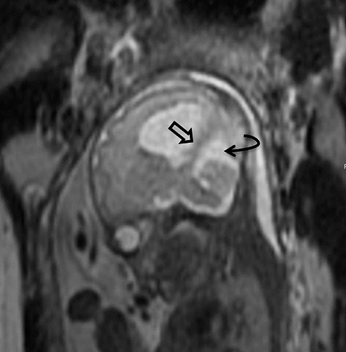 Knowledge of these imaging characteristics is important for the pediatric radiologist, as these same abnormalities can also be seen on fetal MRI, which can lead to an earlier diagnosis and more appropriate family counseling. Martinez-Lage JF, Sola J, Casas C, et al. Atretic cephalocele: The tip of the iceberg. J Neurosurg. 1992: 77(2):230-235. doi:10.3171/jns.1992.77.2.0230. Siverino RO, Guarrera V, Attina G, et al. Parietal atretic cephalocele: Associated cerebral anomalies identified by CT and MR imaging. Neuroradiol J. 2015; 28(2):217-221. doi: 10.1177/1971400915581744. Morioka T, Hashiguchi K, Samura K, et al. Detailed anatomy of intracranial venous anomalies associated with atretic parietal cephaloceles revealed by high-resolution 3D-CISS and high-field T2-weighted reversed MR images. Childs Nerv Syst. 2009; 25(3):309-315. doi:10.1007/s00381-008-0721-6. Patterson RJ, Egelhoff JC, Crone KR, Ball WS, Jr. Atretic parietal cephaloceles revisited: An enlarging clinical and imaging spectrum? AJNR Am J Neuroradiol. 1998;19(4):791-795. Yokota A, Kajiwara H, Kohchi M, Fuwa I, Wada H. Parietal cephalocele: Clinical importance of its atretic form and associated malformations. J Neurosurg. 1988; 69(4):545-551. doi:10.3171/jns.1988.69.4.0545. Lewis H, Tuite GF, Gonzalez-Gomez I, Baron F, Towbin RB, Towbin AJ, Neville Kucera J. Atretic cephalocele: Prenatal and postnatal imaging features. Appl Radiol. 2017;46(8):36-39. Prepared by Dr. Lewis while at the University of South Florida Morsani College of Medicine, Department of Radiology, Tampa, FL;1 Dr. Tuite, Dr. Gonzalez-Gomez, and Dr. Neville Kucera while at the John’s Hopkins All Children’s Hospital, St. Petersburg, FL; Dr. Baron while at Sarasota Memorial Hospital, Sarasota, FL; Dr. Richard Towbin while at Phoenix Children’s Hospital, Phoenix, AZ; and Dr. Alexander Towbin while at Cincinnati Children’s Hospital, Cincinnati, OH.